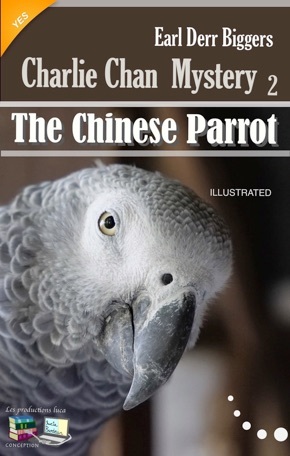 Master detective Charlie Chan had to find the answer to a question, a question posed by a dead parrot who spoke in Chinese. He embarks on a journey across the desert fo find it. He has to go incognito. Carefully Will Holley guided his car down the steep, rock-strewn grade. "Go easy, Horace," he murmured. Presently they were on the floor of the desert, the road but a pair of faint wheel-tracks amid the creosote brush and mesquite. Once their headlights caught a jack-rabbit, sitting firmly on the right of way; the next instant he was gone for ever. Bob Eden saw a brief stretch of palm-trees behind a barbed-wire fence, and down the lane between the trees the glow of a lonely window. "Alfalfa Ranch," Will Holley explained. "Why, in heaven's name, do people live out here?" Eden asked. "Some of them because they can't live anywhere else," the editor answered. "And at that, well, you know it isn't a bad place to ranch it. Apples, lemons, pears... "
"It's only a desert because not many people have taken the trouble to bore for water. Just go down a way, and you strike it. Some go down a couple of hundred feet, Madden only had to go thirty odd. But that was Madden luck. He's near the bed of an underground river." They came to another fence; above it were painted signs and flags fluttering yellow in the moonlight. "Don't tell me that's a subdivision," Eden said. Holley laughed. "Date City," he announced. "Here in California the subdivider, like the poor, is always with us. Date City where, if you believe all you're told, every dime is a baby dollar. No one lives there yet, but who knows? We're a growing community, see my editorial in last week's issue." The car ploughed on. It staggered a bit now, but Holley's hands were firm on the wheel. Here and there a Joshua-tree stretched out hungry black arms as though to seize these travellers by night, and over that grey waste a dismal wind moaned constantly, chill and keen and biting. Bob Eden turned up the collar of his top coat. "I can't help thinking of that old song," he said. "You know, about the lad who guaranteed to love somebody 'until the sands of the desert grow cold.'" "It wasn't much of a promise," agreed Holley. "Either he was a great kidder, or he'd never been on the desert at night. But look here, is this your first experience with this country? What kind of a Californian are you?" "Golden Gate brand," smiled Eden. "Yes, it's true, I've never been down here before. Something tells me I've missed a lot." "You sure have. I hope you won't rush off in a hurry. By the way, how long do you expect to be here?" "I don't know," replied Eden. He was silent for a moment; his friend at home had told him that Holley could be trusted, but he really did not need that assurance. One look into the editor's friendly grey eyes was sufficient. "Holley, I may as well tell you why I've come," he continued. "But I rely on your discretion. This isn't an interview." "Suit yourself," Holley answered. "I can keep a secret if I have to. But tell me or not, just as you prefer." "I prefer to tell you," Eden said. He recounted Madden's purchase of the Phillimore pearls, his request for their delivery in New York, and then his sudden, unexpected switch to the desert. "That, in itself, was rather disturbing," he added. "But that wasn't all," Bob Eden went on. Omitting only Charlie Chan’s connexion with the affair, he told the whole story, the telephone-call from the cigar-store in San Francisco, the loving solicitude at the dock and after of the man with the dark glasses, the subsequent discovery that this was Shaky Phil Maydorf, a guest at the Killarney Hotel, and, last of all, the fact that Louie Wong had been summoned from the Madden ranch by his relative in Chinatown. As he related all this out there on that lonesome desert, it began to take on a new and ominous aspect, the future loomed dark and thrilling. Had that great opening between the hills been, in reality, the gateway to adventure? Certainly it looked the part. "What do you think?" he finished. "Me?" said Holley. "I think I'm not going to get that interview." "You don't believe Madden is at the ranch?" "I certainly don't. Look at Paula's experience the other night. Why couldn't she see him? Why didn't he hear her at the door and come to find out what the row was about? Because he wasn't there. My lad, I’m glad you didn't venture out here alone. Particularly if you've brought the pearls, as I presume you have." "Well, in a way, I've got them. About this Louie Wong? You know him, I suppose?" "Yes. And I saw him at the station the other morning. Look at tomorrow's Eldorado Times and you'll find the big story, under the personals. 'Our respected fellow-townsman, Mr Louie Wong, went to San Francisco on business last Wednesday.'" "Wednesday, eh? What sort of lad is Louie?" "Why, he's just a Chinaman. Been in these parts a long time. For the past five years he's stayed at Madden's ranch the year round, as caretaker. I don't know a great deal about him. He's never talked much to anyone round here, except the parrot." "His only companion on the ranch. A little grey Australian bird that some sea-captain gave Madden several years ago. Madden brought the bird, its name is Tony, here to be company for the old caretaker. A rough party, Tony, used to hang out in a bar-room on an Australian boat. Some of his language when he first came was far from pretty. But they’re clever, those Australian parrots. You know, from associating with Louie, this one has learned to speak Chinese." "Oh, not so amazing as it sounds. A bird of that sort will repeat anything it hears. So Tony rattles along in two languages. A regular linguist. The ranchers round here call him the Chinese parrot." They had reached a little group of cottonwoods and pepper-trees sheltering a handsome adobe ranch-house, an oasis on the bare plain. "Here we are at Madden's," Holley said. "By the way, have you got a gun?" "Why, no," Bob Eden replied. "I didn't bring any. I thought that Charlie... "
"So am I. Walk softly, son. By the way, you might open that gate, if you will." Bob Eden got out and, unlatching the gate, swung it open. When Holley had steered Horace Greeley inside the yard, Eden shut the gate behind him. The editor brought his car to a stop twenty feet away, and alighted.